There will be a 10% deposit when booking and remainder to be paid one month before arrival. 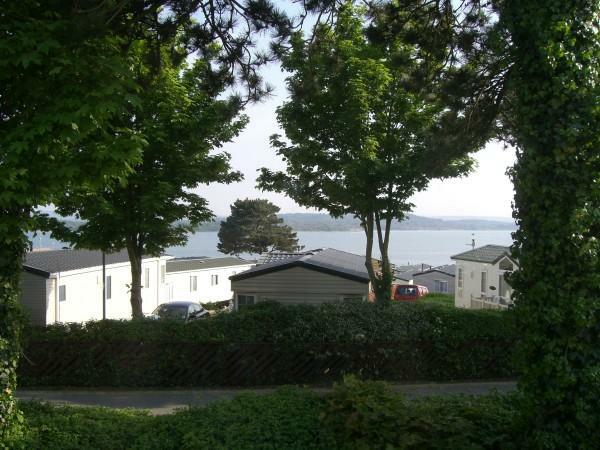 Our caravan at Rockley Park is in the lovely Pine Ridge area with a spacious lounge which overlooks the sea. 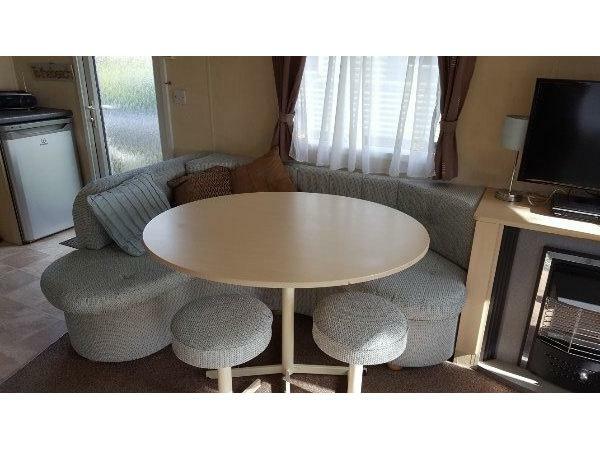 It has two sofas (one a sofa bed) and has a dining area for six people and gas fire. There is a double and a twin bedroom and a sofa bed (sleeps 6). 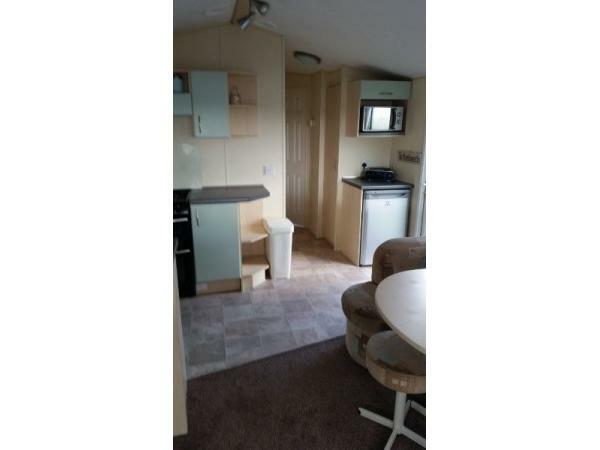 There is a large walk in shower and parking by side of caravan with garden at side and front. The sailing beach is a minute away and the club is five minutes. The lounge features a flatscreen TV with Freeview, DVD and children's games, DVDs and books. 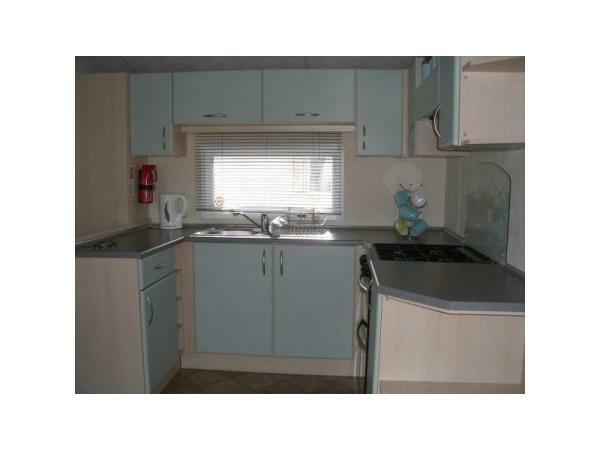 The caravan has a fully equipped kitchen, double glazing & central heating. Sun chairs/windbreaker/tennis equipment/buckets etc available. Garden bench. Sun loungers under double bed. Please bring your own bed linen and towels, tea towels and bath mat (quilts and pillows provided). Bedding can be provided for £15 per room per stay. No Smoking. No pets. No under 21s. Spare quilt for sofa bed is on top of wardrobe in main bedroom. Spare pillows in wardrobe in main bedroom. Beach towel hire £5 each per stay. Key code to be supplied when booked. Rockley Park has many facilities on-site including show bar with day and evening entertainment, restaurant, spa, tennis, indoor and outdoor swimming pools, crazy golf, bowls, outdoor play areas, bikes for hire, archery, shooting and 5 aside football. There are also lovely walks through Ham common to the beach and pier. If you arrive after 5.00pm go to the main entertainment area security and they will direct to where you collect your key. Off peak 7 nts adult £27.75 child (aged 4-14) £13.50 - capped £103.00; 3/4 nts adult £21.50, child £11.00 capped £88,00. Peak 7 nts adult £41.25, child ages (4-14) £21.75 capped £142.00; 3/4 nts adult £32.00, child £15.50 capped £115.00. 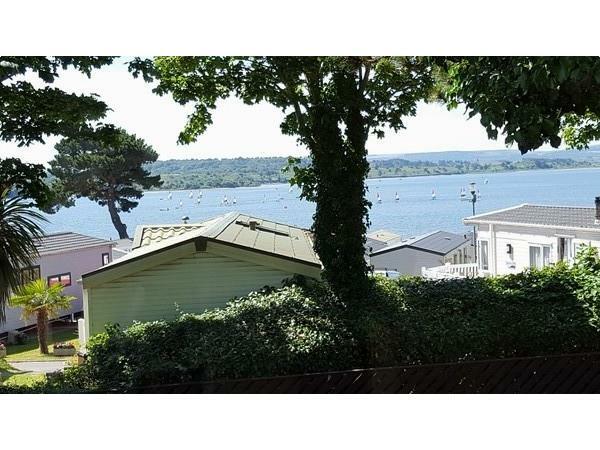 In Poole, there are many lovely restaurants, pubs,a large shopping centre, harbour and greyhound stadium. Nearby Swanage, Bournemouth and Weymouth are well worth a visit and there are many family days out in the area. Additional Info: Outdoor Play Area x 2, Ham common. Passes needed for show bar with day and evening entertainment, restaurant, spa, tennis, indoor and outdoor swimming pools, crazy golf, bowls, outdoor play areas, bikes for hire, archery, shooting and 5 aside football. 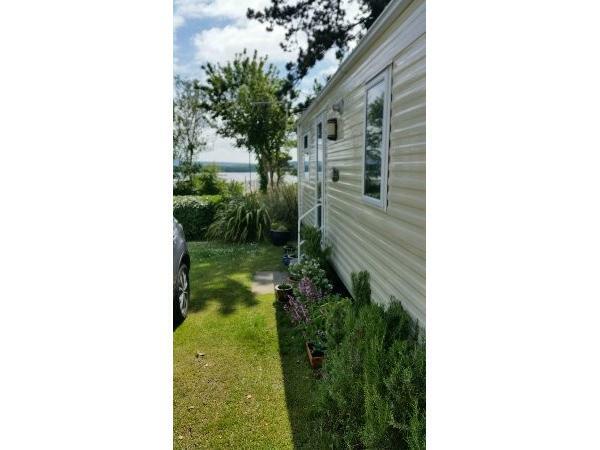 Lovely caravan, great location with fantastic views. Nice homely feel & the children really enjoyed making use of the buckets & spades etc. Cannot praise it highly enough & we will definitely book again. Thank you for your review. Glad you enjoyed your holiday and welcome back anytime. We had a very enjoyable stay. We received lots of information regarding Rockley Park and the caravan prior to our visit. 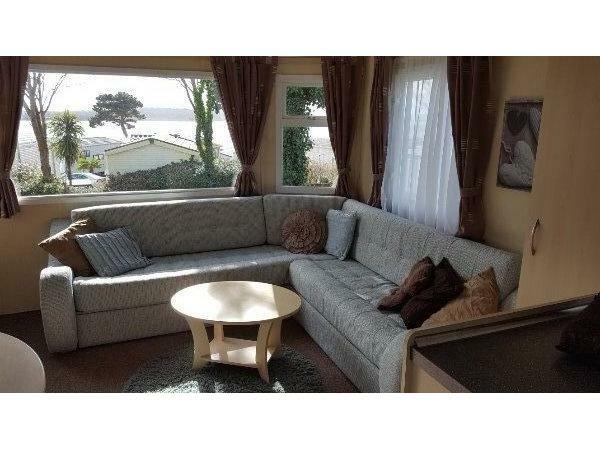 It is in an ideal quiet spot with lovely views across the harbour. Perfect location for the beach for our young children. The caravan was perfect for our needs, very clean and comfortable. Our children loved it! 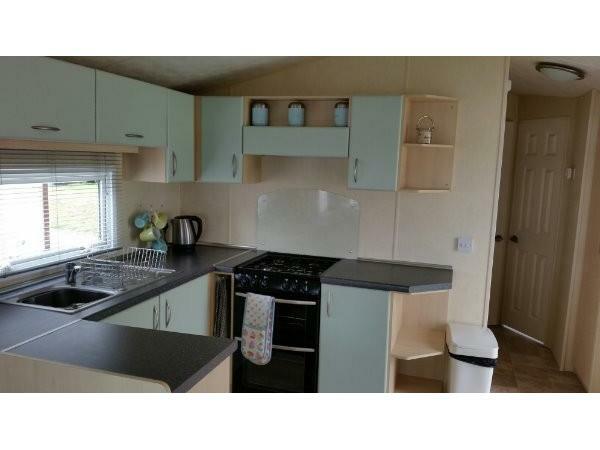 Lots of information available in the caravan as to the great family facilities and attractions in the surrounding areas. 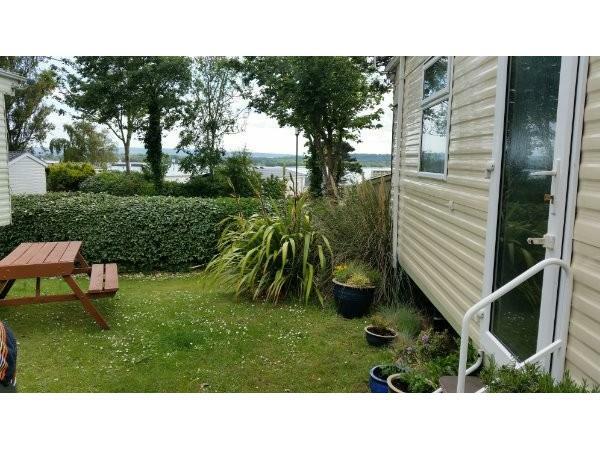 Due to all of the above we have rebooked this caravan for summer 2016! 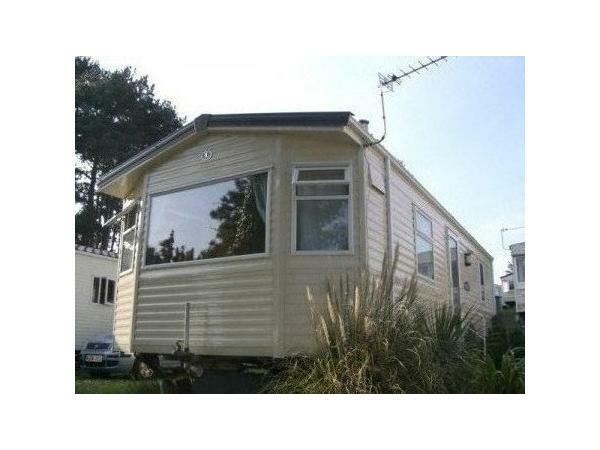 We had a very relaxing stay at this lovely caravan. It is in a beautiful spot with gorgeous views across the bay. Great facilities, very clean and comfortable. Lots of information provided prior to our visit, very easy check in and check out process and lots of facilities to access on site. Some lovely additional bits of information provided about restaurants, places of interest etc which helped us to plan our trip. Many thanks for your review. Glad you enjoyed your holiday.